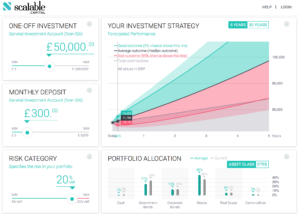 Founded in December of 2014, Scalable Capital is a European online investment manager with 40 employees and offices in Munich and London. It has raised more than $12 million in two rounds, the most recent of which closed in April. Both rounds were led by Munich-based venture capital firm HV Holtzbrinck Ventures. Scalable Capital is licensed in Germany and the UK and also serves the Austrian market. Scalable Capital believes its focus on risk management and on the investor’s risk profile makes it fundamentally different from earlier robo-advisors. It relies heavily on the concept of value at risk, commonly known as VaR. Its proprietary risk management technology was developed in close collaboration with its co-founder, Professor Dr. Stefan Mittnik, Director of the Chair of Financial Econometrics and Director of the Center for Quantitative Risk Analysis at the Ludwig Maximilian University in Munich. Scalable Capital’s primary objective is to generate the best long-term, risk-adjusted return for clients without violating their risk limits. The asset allocation algorithm makes adjustments as soon as a client’s portfolio is too risky or too conservative; rebalancing activities are driven by the projected risk of the portfolio over the upcoming one-year time horizon. Rebalancing is event driven, not calendar driven, which is a major difference to how other robo-advisors or traditional wealth managers operate. Minimum investment in the UK is £5,000. A whitepaper that explains their approach to portfolio construction and trading in detail can be found here. Scalable Capital manages assets for more than 1,500 clients, and typical portfolios range between $35k and $65k, with many clients holding six-figure portfolios. It reports ongoing month-over-month growth of $10-15 million in assets. This is part one of a two-part interview with Ella Rabener, co-Founder and CMO of European robo-advisor Scalable Capital. She is based in London. Q. Ella, thank you for doing this Q&A. I’d like to ask a few questions about your offering and then talk about how you are marketing Scalable Capital. Risk management is a key differentiator for you. How did you develop your risk questionnaire? A. We started with industry best practices. One of our co-founders, Professor Mittnik from the University in Munich, has been on the board of one of Germany’s leading asset managers in the past, so he brings a wealth of experience. He’s also connected to several behavioral economists through his work as the Chair of Financial Econometrics. Obviously, it’s a big part of the conversation you’re going to have with the local regulators, whether in Germany or here in the UK with the FCA. They’ve given their input on what they like and what they don’t like. They don’t write it for you, but it’s a very, very important part of the process. Q. Scalable Capital has 23 separate risk categories. Does that mean that investors are placed into one of 23 predetermined investment portfolios? A. No. I’m glad you asked that question. Everybody gets a unique portfolio when they onboard. It’s one of our differentiators, not just compared to traditional advisors but also compared to the robo-advisor competitors. If you and I are both in the 15% VaR category, and we onboarded at different points in time, we might have slightly different portfolios. This is because there is a portfolio that today, right now, is the optimal portfolio for the 15% category. If you onboard today, you are going to be allocated into that portfolio. If I onboarded a couple of days ago, I might have a slightly different one, but it may not make sense to move me into today’s optimal portfolio because of the bid/ask spread when executing the required trades. Those costs – you sell at a slightly lower price than you would have to pay if you were buying a security – are borne by our clients, even though we cover all the other transaction costs such as commissions, brokerage fees, and so on. Because of this bid/ask spread, we will only move you into the new optimal portfolio if it makes sense for you including those costs. We always optimize on a post-cost perspective, since every cent of performance matters for our clients. Q. Can investors customize your recommended portfolios? For example, can you accommodate a preference for socially responsible investing by say, creating carbon-free portfolios? A. You can’t do that, and there’s a very good reason you can’t. It’s for quality assurance with regards to your risk/return profile on our end. We do get that question, sometimes. The problem is that we really want to give people the best portfolio they can have, from a potential returns perspective, for the risk level they’ve selected. In order to do that, we have to be able to calculate the risk, expressed as value-at-risk or VaR, in their current portfolio accurately, which also requires us to have a long-enough data history on the ETFs we are trading, or the underlying indices they are tracking. If we don’t have that, we can’t really calculate your VaR. So that’s the main problem with the socially responsible investments – it’s the lack of data history. Then there’s a quality problem. If somebody starts to meddle with the investments, we’ll have to go back and ask if they are aware that this is not the optimum investment portfolio. Because it won’t be, for the risk level they have selected. Based on our calculation, at least, it will not be the ideal investment if you start to meddle with it. You may have other reasons why you want to do that and actually be fine with giving up a percent or two in annual performance, but we set out to give you the best possible portfolio purely from a returns perspective for that risk level. If you meddle with it, we can’t do that anymore. That is not to say, though, that we won’t be looking into something like this in the future. However, it would require us to be able to quantify exactly how much performance you’re sacrificing that way, as transparency is so important to us. Investors deserve to know what trade-off they are really making. Q. Is the same true for customers who come to you with existing holdings, or things like options on illiquid company stock? A. The problem is, again, that we could not include those investments in our VaR calculation. How could you determine their risk? Our risk calculation is based on a certain history, so we make assumptions about the stochastic processes for the different asset classes, based on the data history and on the typical behavior and characteristics, whether that’s long term or in the short term, because characteristics can change over time, obviously, depending on the market environment. If, for example, you have equity options in a private company, we don’t have any way to accurately assess the risk of this investment, as there is no data history available that our algorithm could work with. We also wouldn’t know how its return correlates with the returns of our other asset classes, so the equities or bond markets in general. And that’s a problem, because understanding correlations is so important to understanding the risk of a portfolio that is composed of several securities. Will the returns of one asset go up if the returns of the other go down and vice versa? We need to understand those relationships to optimize our client’s portfolios and come up with a real picture of the risk they are exposed to. So we’re really there to help them optimize their liquid wealth. They can, however, transfer an existing capital markets portfolio to us and we will sell and reinvest it for them, which is a lot cheaper than if they were to sell it down themselves. Q. What about the tax implications of trades? A. One of the reasons why we have a managed accounts approach as opposed to putting people into pooled accounts, or giving them shares in a fund, is that it will allow us eventually to do post-tax optimization, or what you in the U.S. would call tax-loss harvesting. We aim to be doing that. We can’t do it yet, but we are definitely planning to add that functionality in the future. Optimizing for post-tax returns will be extremely relevant for all of our investors, and we want to give them the best service we possibly can. It is going to be more complicated for us than for U.S. companies because we need to do it across different jurisdictions. Even though for now we are operating across EU countries only, taxes are very local. But we are set up in the right way, having the individually managed accounts and working with an algorithm that in the end can handle a multitude of different tax structures without creating any additional costs. Q. It looks as though your portfolios can swing from 100% equities to 100% government bonds. If a risk projection signals a violation of the VaR target, the portfolio will be rebalanced to ensure that it stays within the assigned risk corridor – regardless of when the last rebalancing took place. This allows you to immediately respond to changes in market conditions in a timely fashion. A. It’s not 100% correct that they can swing as extremely as you just described. We have built in maximum thresholds that depend on the risk category, both for regulatory reasons but also for our internal reasons, as a safety mechanism. So, for example, in a VaR 3% category, we would never invest more than 25% in equities while the VaR 25% category, our highest risk category, can get a lot closer to 100% for the equity allocation. In addition to that, we also have thresholds for the individual ETFs. In a 25% VaR category, for example, you would never be invested 70% in emerging markets stock, because we’d say that’s too extreme, no matter what the algorithm said. Or Japan, for example, because Japan is covered by an ETF on its own. We would never invest you to that level in Japan, as it’s just one single market and a very particular one, too. Q. Does your approach to portfolio rebalancing imply market timing? Doesn’t the data show that the best results come from a buy-and-hold approach? A. We don’t believe in market timing and that’s not what we do, although I can understand that people might reach that conclusion and use that term. Historically, it’s been used to describe an approach where asset managers try to predict future market returns, as in the degree of a price movement in a certain direction. But we don’t predict returns, because research, as you say, has indicated that is not possible to do that with any sort of reliability. If Apple stock goes up today by 0.5%, you’re not any wiser about what it will do tomorrow. So timing the market in the sense of spotting undervalued or overvalued securities or seeing a trend in the return path of a stock is not something we believe in. What we do is we predict risk, because risk has been shown to be correlated over time. It’s called volatility clustering. You can’t predict the direction of a move, but can you say how much the market will move tomorrow with a better than 50% chance? You actually can. If there have been a couple of days with high volatility, so strong movement in the markets, chances are higher than 50% that tomorrow you are going to see a lot of movement in the market as well. We use that characteristic to focus on predicting risk instead of trying to predict returns, adjusting our clients’ portfolios when risk is building up or coming down in the market. There was even a Nobel Prize awarded for work on volatility clustering in 2003 to Robert Engle. A lot of others also refer to Nobel Prize-winning research, but they typically talk about using modern portfolio theory, which is from the ‘50s, and makes a lot of simplifying assumptions, for example about returns being normally-distributed or correlations being stable over time between asset classes, which are now broadly known to be incorrect reflections of the messy reality out there. These days, we don’t need to work with these assumptions anymore because we have far more advanced computational methods at hand. So modern portfolio theory was great at that time, but black-and-white TV was great once upon a time, too. I don’t want to bash Markowitz and his model, as it was ground-breaking work in a world without cheap computing power. But we’ve moved on. We use volatility clustering, which has been observed for decades, in order to predict risk, and we don’t work with assumptions about how the markets behave that are out of sync with reality. But it’s really different from what is called market timing and we don’t call it that. There is also evidence out there that such a risk-focused approach outperforms a simple buy-and-hold approach, as it helps our clients to avoid periods of excessive risk in the markets that frequently coincide with losses. A recent Yale study reached that conclusion, too. Q. That’s a very sophisticated concept, and value at risk is a very sophisticated concept. How do you explain these concepts and make them compelling and real to retail investors? That would seem to be a major marketing challenge. A. First of all, we are probably not talking to the average person right now in terms of our target audience. We are really targeting smart professionals in the mass affluent sector who are willing to spend an extra ten or even 15 minutes to understand our concept, because selecting someone to manage their money is a very important choice for them and they will take the time to understand what’s going on. 95% of our clients have a university degree, they earn on average around $130,000. But I think VaR itself doesn’t have to be complicated if you explain it the right way. What it basically means, in the way we calculate it, is that in 19 out of 20 years your portfolio valuation is not going to decline by more than X percent, which is your risk limit. It’s basically just one sentence which summarizes it. Why we use it and how we communicate it in terms of a benefit to clients is that you should know exactly how much risk you have in your portfolio. We don’t use a term like “moderate risk.” What does that mean? What is “moderate risk” for you? Maybe your understanding of “moderate risk” is totally different from mine. And is “moderate risk” always moderate? Is it still moderate in a year? Is it still going to be moderate in three years when maybe the markets have crashed? It’s probably not. So we tell you a) how much risk you have as a specific annual loss risk, and b) we manage your portfolio in a way to keep that risk as stable as possible so you don’t end up with the supposedly moderate risk portfolio that all of a sudden is very risky because you are in a market downturn and asset classes are correlated and everything goes down the drain together. Then you’ll be surprised that your “moderate risk” portfolio suffers a loss of more than 20%. A. We did quite a lot. We reached back for data as far as 2000, which is the longest time period for data you can get for the ETFs we are trading in, and also for some of the underlying indices. Then we compared the different risk categories that we have to a benchmarking portfolio that was always composed of the MSCI World and different levels of cash in order to bring it to a comparable risk level as the portfolio we were comparing it with. If we were looking at a VaR 5% portfolio, we were comparing it with a portfolio composed of the MSCI World with quite a lot of cash; if it was a VaR 25% portfolio, we were comparing it to the MSCI World with very little cash. We were careful to compare apples to apples. We aren’t allowed to publish back-testing data, but we were very happy with our back-testing results; otherwise we would not have defined the algorithm the way we are running it right now. I should add that one of our co-founders, Professor Mittnik, who put quite a lot of money into the company himself, has been working in this sphere of risk management and measurement for decades. He’s a leading global expert on the topic. He’s worked with major assets managers before and was an advisor to the German Bundesbank, the Central Bank, as well. He’s been looking into these types of algorithms for quite a long period of time. Q. We know that one of the best ways to boost your returns is to lower your costs. You are way undercutting the traditional industry in the UK. Total costs of 75bps are low for the UK, where investment management service can cost 2%-3%, but high compared to similar services in the U.S. Is there room for further cost reductions as you grow? Or are your services different enough from the others that the higher fees are justified? A. I would definitely agree with your last statement. I think our service is very differentiated to what the others are offering, so I don’t expect us to have real price pressure any time soon. On the other hand, I also have to say that the costs of doing business in Europe are higher than in the U.S., which is also reflected in the higher costs of the ETFs. When you look at our ETF universe, on average the costs are 25bps versus the U.S. where you have ETFs now that are 5bps. We put a lot of effort into selecting the most cost-efficient and best ETFs in terms of tracking error, liquidity, and so on for our clients. So it’s not like we are selecting expensive ETFs on purpose. Also, trading costs and custodial charges are higher, so there are differences across markets. The good news is – the more that comes down, the more end users will benefit. Q. What else would you like people to know about Scalable Capital? A. I don’t understand why we don’t see more investment managers using a more technologically advanced investment process. I understand that huge benefit comes from lowering the cost, and making managed investments more accessible to regular people. That is a huge step and I applaud all the earlier players for taking that step. That was very courageous, as well, to try this out. But you can do so much more, given that cloud computing, quite frankly, has made computational power so cheap. Why aren’t we seeing more companies that really use an algorithm for risk prediction similar to what we are doing? Or, if they have a different philosophy, fine. But very often when someone talks about an algorithm, what happens in the background is static rebalancing to original weights of 60/40, for instance. You don’t need an algorithm for that. You need just an Excel spreadsheet and basic math. It’s also easy for investors to get confused about who is doing what. Some competitors use similar language to the language we are using, while doing something that is a lot simpler and actually not very different from what the traditional industry has been doing for decades. So I’m worried, quite frankly, that a lot of consumers will have a very hard time to figure out what the differences are between the investment philosophies of the different providers, even though that is extremely important as it will have an impact on their returns. And the press is only starting now to dig below the surface, so not just writing articles comparing fees, but explaining the more intricate details of what’s really going on with regards to the money management side of things. That’s important, because as a consumer I won’t base my decision about where to invest my money just on the fee structure. I’m not going to just put it with the robo-advisor that has the lowest fee. I would want to know how they’ll manage my money, right? I feel there is a need to write more about that. In the past, too much time has been spent talking about the packaging of the product instead of about the content of the package. Join us next week for part two of this interview, in which the conversation moves to marketing. This entry was posted in FinTech, Startups, Wealth Management and tagged CMO, robo-advisor, Scalable Capital by jim. Bookmark the permalink.